Isa and I returned home on the 12th. It was a good trip but both Isa and I were happy to be home and with Jeremy again. 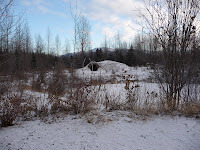 Before we came back to Unalakleet we had the opportunity to visit some really neat museums in Anchorage. The Native Heritage Center was really great with life size homes from the five Alaska Native cultures . 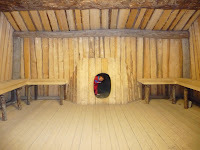 Isa and I enjoyed the Inupiaq house which was by far the warmest of the houses. Here you can see Isa standing outside the small entrance to the house. The house had an arctic entrance of 40 feet down into the ground opening up into a very nice, warm, and bright room complete with polar bear skin. To the left you can see Isa climbing down through the entrance. Once inside you pass through a small little hole into the house. Here is a view of the Inupiaq house from faraway. You can see how snug and warm it would be. Weather here is cold but not too bad. Beautiful winter landscape. Jeremy's mom and dad will be visiting us next week and staying through Thanksgiving. It will be fun to show someone around the place and share its unique beauty.